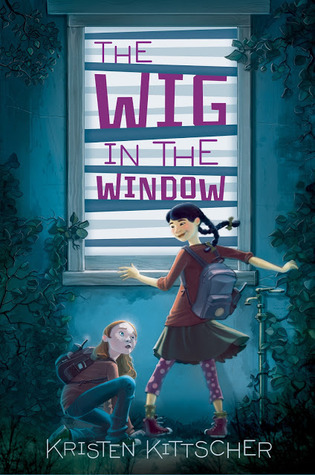 The Wig in the Window by Kristen Kittscher. Harper, 2013. Currently Available. Does it Break the Slate? Yes, this book 100% without a doubt breaks several slates into hundreds of pieces. It happens on many levels too. First, there are wonderful, interesting, complicated and multi-dimensional preteen female characters. Several of them. These aforementioned characters have all the agency, and are totally capable of making things happen for themselves. Who would we give it to? Moved on from Cam Jansen but not quite ready for Veronica Mars? Ladies, let me introduce you to Young & Yang, a crimefighting duo with smarts, toughness and just the right amount of unadvisable risk taking. Review: Best friends Sophie Young and Grace Yang have a habit of sneaking out at night to spy on their neighbors (all part of Grace’s plan for eventual FBI training). But things get suddenly serious when spying on Luna Vista Middle School’s counselor Dr. Charlotte Agford. They overhear some yelling over the phone and see her chopping away at something – something bloody. In a panic, Sophie calls 911. The friendship between Sophie and Grace is one of the best out there. The basis for the friendship is clear, but that doesn’t mean there aren’t problems between them. Sophie covers for Grace, but it doesn’t mean she’s totally happy with the fact that she’s the only one dealing with the fallout from their surveillance escapades, and that she seems to end up taking most of the risks based on Grace’s big ideas. She also worries about being overshadowed by Grace’s confidence, capabilities, and effortless sense of style. Grace gets jealous of Sophie too, especially as she worries that Sophie is making new friends and interests and school (Grace is homeschooled). Perfect. But also, it’s not like Sophie is portrayed as a total idiot – or a bad friend. She and Grace have each others’ backs, and it’s clear that their friendship will survive the transition into being teenagers. But it’s not just the one friendship in this book either. Trista, the tech genius who befriends Sophie during her ostracizing at school, is another smart and Slatebreaking character. Again, Kittscher pushes against stereotypes. Trista is overweight and unpopular, but she actually eats way healthier than Sophie does, and is totally happy with the way she looks. She also proves a reliable skeptical foil, but one who is willing to suspend disbelief and help out when it matters. As for the mystery itself, it is both really well plotted and actually kind of terrifying. This is no “case of the missing cat” kid’s mystery – the story that Sophie and Grace uncover is way bigger than they thought it would be, and they are quickly in way over their heads. And while there’s a certain level of suspension of disbelief that’s necessary to believe the FBI needs 2 seventh graders to get to the bottom of a mystery, it’s also not as implausible as you might think. There are legitimately surprising twists and turns, actual danger, and a truly satisfying resolution. This entry was posted in Middle Grade, Reviews and tagged Detectives, Friendship, Mystery, Race, Suspicion. Bookmark the permalink.